With one of our favorite running events coming up -- The Brooklyn Mile -- coming up on August 19th, we're flashing back this week to when Captain Amir and HR Regular/Run-Walk Queen, Cynthia, crushed it. Are you looking for a run, fast race to add to your calendar with good vibes? Read Cynthia & Amir's recaps below and SIGN UP HERE! At first, the idea of a race in the middle of August did not appeal. But when I saw that "Masters Women" (Me? A "Master" in my second race? I like that terminology!) would kick off at 9am, I decided I could brave the morning heat. Although I've gotten myself to the point where I thought "It's *only* a mile," or "*only* 10 minutes of running," we were in the middle of a heat wave and so I figured I would need to take walking breaks. 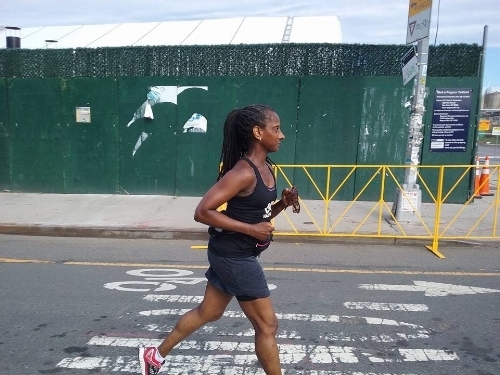 I had no illusions of beating my Harlem 1-Miler time of 8:37-not in this heat and humidity-and I made no last-moment sprint in the last 100 yards. So I was pleasantly surprised when I approached the finish line and saw that the clock had not yet hit 9:00. "How the heck did that happen?" I yelled at the clock. It's always tough hosting the #Harlem1Miler when you really want to be out there with every else running your fastest mile. When we got wind of the Brooklyn Running Co. hosting their inaugural one mile race across town I jumped immediately at the opportunity and signed up to represent the movement! The day of the race, it was so good to see so many familiar faces, take some pre-race photos and just chill. After warming up, the gun went off and it was off to the races! The first quarter was just us runners and the streets, and then slowly but surely more groups of cheer squads started to emerge. Seeing everyone was a great spark to push me further. As soon as I hit the 800m mark I went into over-drive! Special thanks to all the cheer squads. All boroughs were represented and everyone crushed it!